One of my favorite inspirational movies remains Stand and Deliver. 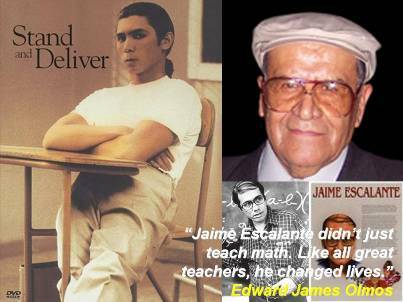 Edward James Olmos played Jaime Escalante, a man some have called “the best teacher in America.” From humble origins in Bolivia, Jaime came to America to pursue a dream. With $3,000 in his pocket and the drive to be successful, he came to America. He knew little more English than “yes” and “no.” From mopping floors, to cook, to electronics technician, Jaime worked by day and studied math and physics by night. Always wanting to be a teacher, he took a pay cut to teach at Garfield High in East Los Angeles. Elaine Woo in the Los Angeles Times, reported the comments of Gaston Caperton, the former West Virginia Governor and president of the College Board: “Jaime Escalante has left a deep and enduring legacy in the struggle for academic equity in American education. Because of him, educators have been forced to revise long-held notions of who can succeed.” Jaime knew what he could do with the right motivation and a dream. He spread that contagious belief. Sometimes it is important to have people who believe in you before you believe in yourself. As one student said, “If Kimo can do it, we can do it. If he wants to teach us so bad, we can learn.” It’s our job to believe in all our students. Our optimism feeds their optimism! Jaime was appalled at the low level of expectations in American schools. The watered-down math books were at a level of 5th graders in Bolivia. He pushed for more. High goals are more motivating than low goals, and Jaime proved that over and over again. He angered fellow teachers by challenging for high standards, fighting against bilingual education and supporting conservative political candidates. He eventually left Garfield High and America, returning to Bolivia to make a difference there. “All too often, minority kids never hear about anyone other than athletes. They don’t know the living you can make with your mind. When I hear the same thing in black schools as white, kids talking about becoming doctors and lawyers, I know the ghetto will disappear.” Amen! It’s time we stop focusing just on victims and start telling the stories and lessons learned from the victors who found a way to live the American anyway! I loved Jaime Escalante’s final comment in one of his last interviews before his death March 30th. “I had many opportunities in this country, but the best I found in East L.A.,” he said. “I’m proudest of my brilliant students.” When you serve, you are indeed served yourself…and, in this case, you are honored. Reports are that the new gym being built at Garfield High School will be names in Jaime Escalante’s honor. Please let it be so.